Silicon Valley-based early stage VC firm Storm Ventures has announced a $10 million (around Rs 68 crore) fund for investments in software-as-a-service (SaaS) startups in India. The money will come from the $180 million Storm raised last year. The $10 million Storm India SaaS Fund will focus on cloud startups with an annual revenue run rate of $1 million to $10 million and participate mainly in seed and Series A rounds, according to a TechCrunch report. "We invest mostly in companies that are based in the US, but what we've noticed over the last few years that India is now where China was five to seven years ago," Anshu Sharma, partner, Storm Ventures told TechCrunch. "There will emerge a whole set of new application companies to support the new e-commerce and payment ecosystem, so we think it's great timing." He further said he wants to find the next Salesforce or Zendesk in his home country. Besides Sharma, two more Storm Ventures' partners -- Sanjay Subhedar, and Arun Penmetsa -- are Indians. Queries sent to Sharma by VCCircle on the development did not elicit any response till the time of filing this report. A few days back, Storm Ventures led a $8 million (Rs 53.2 crore) in a Series A round of funding for San Francisco-based Blueshift Labs Inc, a Big Data-powered marketing solutions firm, which also has customers in India. 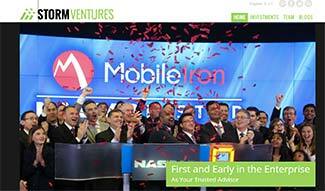 Storm Ventures focuses on mobile and cloud enterprise startups. It has so far invested in 63 startups in SaaS and mobile vertical across the world. It has about $500 million under management. In the past few years, there have been new funds launched for SaaS startups in India. Earlier this month, Unicorn India Ventures, an early-stage venture capital fund focused on B2B startups in the social media, analytics and cloud segment announced its first closure of Rs 40 crore on its Rs 100 crore fund. California-based Vertex Ventures (not the same as Temasek's VC arm that also operates under a similar name) raised $151 million in its debut early-stage fund named Vertex Ventures US Fund I, LP. The fund will focus on enterprise and cloud startups. Infosys had invested in Vertex Ventures as part of its startup investment programme.